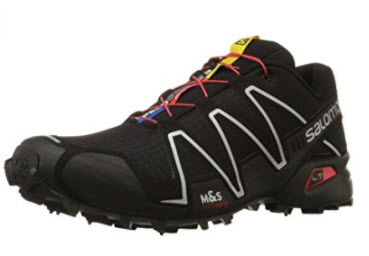 This is a “dirty” review of the Salomon Speedcross men’s trail running shoes – I just wouldn’t have felt right putting out a review of these beautiful grippy trail shoes with out putting them through a few miles on some muddy single track! 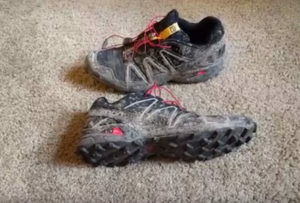 And grippy is the right word – I was able to really climb up some dirt hills with these on and can see how they would be amazing in the right dirt and mud environment. That said, after several miles it had flattened out a bit and was comfortable. My estimate is that these are a bit on the narrow side but can be pushed out over time (a few miles) so long as your foot isn’t extra wide. I would make sure to order online from somewhere like Amazon where you can use Amazon Prime to return for free in case it turns out to be too narrow for your liking. The Salomon Speedcross trail shoes are lightweight and felt good to move fast in. The lighter weight and snug fit help me feel like really moving faster (sounds goofy, I know…) and had me flying down a few hills. This is a really grippy lightweight shoe that excels in the mud and dirt that you'll find on some singletrack. However, you can't expect great performance on flat rock and wet logs - that grippy aggressive lug comes with a price. But, if dirt tracks are what you're looking for you should check this shoe out.